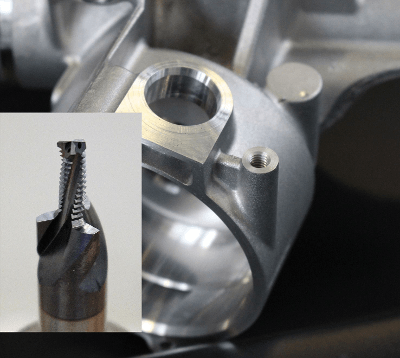 Through a process of close cooperation between ZF Lenksysteme, the application engineers and the design department at JBO, a premium class solid carbide drill thread milling cutter with a difference was developed. The challenge: To complete the steering housing using just four machining steps are required – drilling, countersinking, spot facing and thread milling. When it comes to complex tasks such as this one, JBO has a deep fund of experience to contribute. The Albstadt-based company specializes in the manufacture of thread milling cutters, drill thread milling cutters, thread cutting dies and precision thread gauges for standard and non-standard threads. JBO has been developing, designing and producing non-standard tools for highly complex machining operations for over 100 years. For ZF Lenksysteme, it designed a tool which executes four complete work steps in just two work processes: Core hole drilling, producing a 45 degree countersink and spot facing in the first work process, milling the 10 mm deep through hole thread in the second work process. For further information about JBO products in Australia, see our Boss page and contact us direct. The solid drill thread milling cutter designed for machining the steering housing completes four complex work steps in just two work processes: Core hole drilling, 45 degree countersinking, spot facing and through hole thread drilling – all in 2.5 seconds.